The American – German Colony was founded by the Christians in the 19th century. It is located between Tel Aviv and Jaffa. Recently, there have been efforts to restore and redecorate the housing there. This history rich tour will answer many questions and give you deep insights into the American-German Colony and Tel Aviv in general. The route of the tour is very interesting and is done in a specific order including all the main attractions and places of interest including: The Rav Kook House, The Sorsok House, The Gesher Theater and the Flour Factory of Family Golomov and the Susanne Dallal Center. It’s well worth touring this fascinating area and thereby learning the history and people of this area. 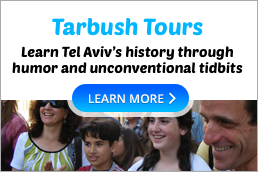 Booking a tour: The Tarbush Company arrange the dates and times of tours. Meeting Point: By the Mitcham Ha’Tachanah – New Station. Be prepared: Come to the tour equipped with a sun hat and water.